Many parameters influence the reaction kinetics of photocatalytic degradation of organic pollutants and their effects need to be evaluated. In this work, a full factorial experimental design was used to study the main parameter effects in detail and their interactions on the kinetics of mesotrione removal using TiO2 Hombikat (TiO2) suspension under simulated sunlight. 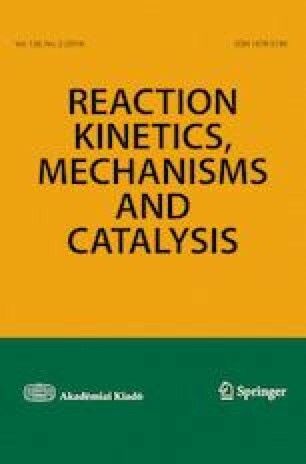 The parameters which affect the efficiency of mesotrione photocatalytic degradation such as the loading of TiO2, concentration of KBrO3, absence/presence of fullerenol (FNP), as well as O2 purging were investigated. The photocatalytic degradation efficiency of mesotrione (%) in the range from 43.3 to 96.7% and apparent rate constants (kapp), obtained by exponential fitting, in the range from 1.849 × 10−2 min−1 to 6.228 × 10−2 min−1 with coefficient of determination ~ 0.99 are used as responses. From the statistical analysis in the case of both responses, the highest influence on the system has parameter loading of TiO2. The highest percentage of mesotrione removal was achieved with all parameters at high level, while the highest value of kapp was obtained under the same experimental conditions but in the absence of fullerenol. The online version of this article ( https://doi.org/10.1007/s11144-019-01571-3) contains supplementary material, which is available to authorized users. This study was supported by a grant from the Ministry of Education, Science and Technological Development of the Republic of Serbia, Project Numbers: ON 172042 and III 45005.